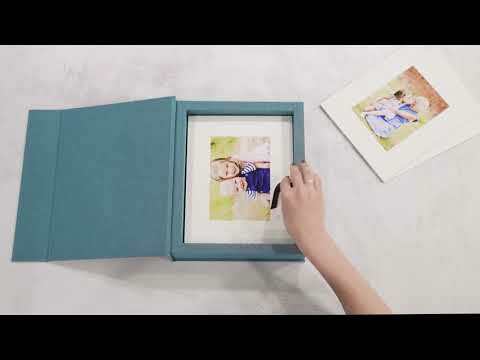 Matted Print box - Showcase your photography portfolio in style! Showcase your photography! Now available in 3 sizes!. Our stunning Matted Print Boxes are a perfect addition to your packages this year, or a great way to market your work! Choose from one of three sizes: 14×11”, 10×8” or a petite 6×5” box. We’ll print your photographs for you or you can opt for slip in mounts without prints for greater flexibility. You can even add an optional easel to display your photographs in style. Our Matted Print Boxes are available in a variety of high quality fine art papers; so you can choose the right paper to best showcase your gorgeous images. With 30 different colours of linen to choose from and a choice between a personalised or cameo cover. We give you the flexibility to customise each box to fit your unique theme. All Matted Print Boxes are available with an 8GB or 16GB USB stick, neatly concealed in the bottom of the box and can hold up to 15 mounts.